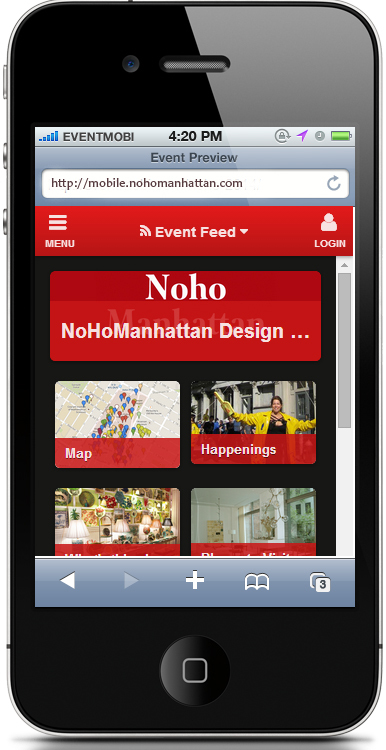 with the easy on-line NoHo APP which we are updating with all the Fall/Winter events in the NoHo-Bowery area. Visit the Map, our exclusive custom Google map, make it big or small, move it around…then click on the place you want to know about to get their address and phone. Click on Places to Visit, scroll through the more than 200 locations on Categories, choose Restaurants, Fashion, Design, Furnishings and find exactly what you want. Click on the name of the place and it will take you to their screen with a description, their FaceBook or Twitter page, their phone, their website. The What’s Happening tab brings you to our extensive listings of theater, gallery, music, museum and special events – day by day – click on what you like and it will open to all the details, plus the link for tickets. Want to see what’s happening in December? Click more and see all the dates with listings. The NoHo APP is free, requires no downloads, works on ALL devices. Enjoy a NoHo for you, wherever you go.